The Rescue Plan. Is my money safe at the Bank? Well to be honest, I would like to say yes. If you asked me the same question some months months ago, I would have undoubtedly said yes. Now however I actually have a sliver of doubt. It’s true that the Federal Deposit Insurance Corporation (FDIC) pledges to insure your money. This insurance comes fortunately or unfortunately comes from the US government, and the government itself is largely in debt. As we’ve seen with the $700 billion dollar bailout, the government is willing to take on more debt. 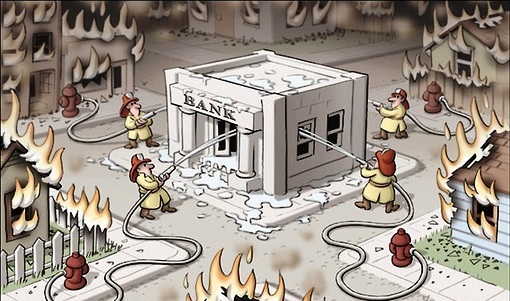 The problem is what happens if a lot of the bigger banks start having still more problems. How many billions or trillions or extra money does the government have to give people? MONEY… Do you deserve it?